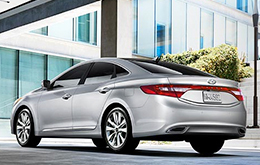 The classy, elegant Hyundai Azera is curvaceous in every way. Rippled lines are seen throughout the exterior, giving the sedan a feminine touch and its fierce, dramatic headlamps produce a mysterious yet engaging look. Chrome accents along the windows, taillamps and hood also contribute to the Azera's decadent style that is both sleek and modern. Offered in one trim level, the full-size sedan features a luxurious interior with a copious amount of space, seating five comfortably. Its V-6 powertrain is also reliable and works with a well-tuned suspension to create optimal handling and a smooth ride quality. Taking cues from its exterior design, the 2014 Hyundai Azera features a lavish interior with leather upholstery, giving it an upscale appearance that Arlington buyers will admire. Heated front and rear seats also create a comfortable atmosphere, keeping occupants warm and toasty during the cool winter months. Generous, the 2014 Azera extends its luxuries even further by offering ample space throughout the cabin - mentioned in several 2014 Hyundai Azera reviews. Adults are able to easily climb into the backseat with no problem and there is more than enough leg/headroom in both the front and rear of the vehicle. An additional 16.3 cubic feet of cargo space is offered in the trunk, providing sufficient room for luggage. Outfitted with a V-6 engine and a well-tuned suspension, the Hyundai Azera produces a ride that's just as smooth as its flowing exterior design. Its 3.3L V-6 engine, delivering 293 horsepower and 255-lb.-ft. of torque, comes paired with a six-speed automatic transmission and features quick acceleration, jetting from zero to 60 mph in 6.7 seconds. The Azera also exhibits fantastic handling and shows off sufficient EPA ratings, producing low gas mileage. 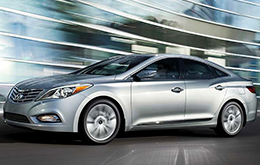 Want to learn more about the 2014 Hyundai Azera in Arlington? Read on below! The 2014 Toyota Avalon, Ford Taurus, Buick Lacrosse and the Chrysler 300 are eclipsed by the 2014 Azera in several areas. You'll be pleased with the Azera's long list of outstanding qualities, including its competitive price and modern features. Hundreds of Arlington Hyundai drivers choose it because it's a fantastic value; just compare its price to the vehicles in its segment. Check out our Quick List below for more information! 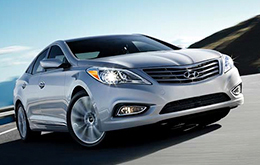 Thank you for reading our complete 2014 Azera review, written by Vandergriff Hyundai's automotive authors. Not all Arlington car franchises are alike. We differ from others in that we feel it's our job to provide customers with quality reviews. This Hyundai review contains credible information about the Azera and it's specifications, safety technologies and more. Is the Azera not the right option for you? Learn more about other vehicles on the lot at Vandergriff Hyundai using our reviews directory. 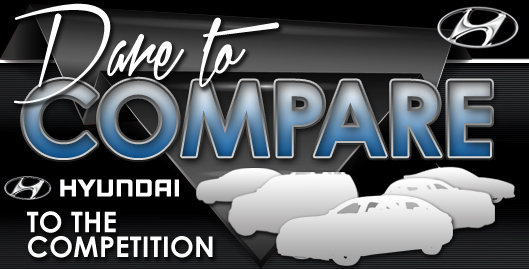 With it you can review and compare Hyundai's entire series of vehicles.